∑PROS/ Bandicam free screen recorder is really worth your time to download and install it on your computer. It is a FREE- POWERFUL SCREEN RECORDER for game play and other screencast purposes. ∑CONS/ Like most of other free screen recorders, Bandicam is only suitable for simple recording purposes that don’t require editing functions. It is shortage of necessary editing features of a professional screencast software where you can get in its pro version only. ∑OUR CONCLUSION: This is entirely a good free screen recorder for game play, screencast, screen shots regardless of its’ Cons we mentioned above. 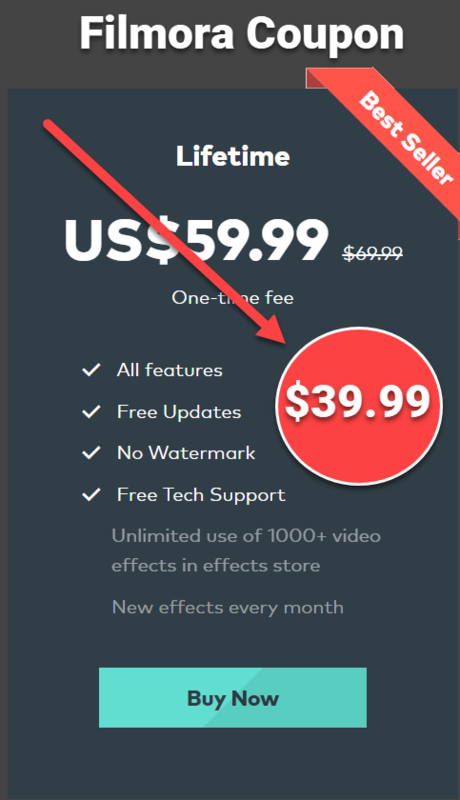 Purchase Bandicam Pro version at $39, you can remove the watermark and use it forever. As we mentioned about this tool in our previous post which we stated that “Bandicam has been famous all over the world as a favorite screen recorder for game players and screencast creators. Although it does not include powerful editing tools like ActivePresenter but its’ recording capabilities is really fantastic.” Truly it is! In free version, you only have 10 minutes recording time. In our opinion, “10 minutes” is a very long time for a shot footage in the procedure of creating screencast video. Normally, a video on YouTube will last about 5-10 minutes only. When purchasing pro version, the time limitation will be removed. See the comparison down here. Updated news: The best Christmas Software deals are available now! Record video full screen or customized resolution at max FPS 144 and save file to AVI, MP4. Record audios from speaker and microphone in PCM or MPEG-1 L2 codec. Record Webcam and HDMI capture device, add webcam overlay. Customize hot keys, show/hide hotkey and show FPS overlay while recording. Record mouse cursor, add mouse click effects. Add a logo to recorded video with some position set up. Take screen shot during the recording with some popular formats: BMP, BNG, JPG, JPG- high quality. Video and image quality is good in comparison with some other free tools I’ve tried. There are some users complained about some noticeable lags while starting and stopping recordings, We don’t think so! During our test, Bandicam give good result both in normal screen recordings or game play (AOE, Half life, Star Craft..) recording that we tested. It is impossible to remove the watermark while we are using free version. Not able to edit video after recorded. You need another video editor for this work. Want to get rid of Watermark? Check out these no watermark screen recorders. To be honest, I have not contacted Bandicam’s team for technical support yet. Because I don’t have any issue to complain about this software. Anyhow, it doesn’t mean that you will not meet any problem. But, you can be sure that they have an online support community, an official YouTube Channel and dozen of how-to tutorial where you can access easily. I am pretty sure that the said purchase price at $39 for 1 PC and $59 for 2 PC is a good deal in comparison with some other professional screen recorders you can find on the market right now. That’s not to mentioned few good free screen recorder like ActivePresenter or OBS where we’ve reviewed recently. If you are a keen gamer, Bandicam is a perfect tool for you to record your game play without lags. Try it and share with us your opinion. Thanks very much for being here. I hope you try it and let me know if this software is useful for you or not. It is really important that you let us know how you feel about the software and the post to make us better. Editor’s notice: This post is updated with publisher’s description since October 31th – Happy Halloween.